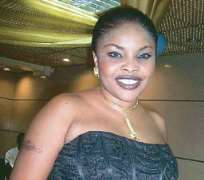 That top Nollywood actress, Lola Alao is a damn good actress who has gleaned more than a decade's experience in the Yoruba movie industry is like stating the obvious. However, as this babe rises in the make-believe profession with lots of attendant media buzz, so also are the gales of putrid tales surrounding her romantic liaisons with various men, especially the married ones. City Players gathered that this Igbira-born pretty actress has turned a femme fatale whom many of her 'prey' find difficult to let go until they are burnt. The tattoo-loving actress is a siren that gets her victims ensnared while their relationship lasts, and she has unabashedly enjoyed her runs which have ruined many relationships. We learnt that the tales about this lady's runs are so many that they could make a Nollywood blockbuster movie. Highlights of which range from Lola's alleged short fling with a certain young serving governor from the North-Central zone of the country. The affair was so steamy that it attracted the attention of the governor's wife who quickly disconnected any link that existed between her husband and Lola. In the late 1990s when Lola was younger, the siren was said to have arrested the heart and soul of an Ile-Ife, Osun state-born industrialist, who picked Lola as wife. The Ife prince was said to have been head over heels in love with Lola that by the time the love flame had simmered, the man suffered a terrible stroke that nearly cost him his life and his thriving business. Even then, he finds it difficult to forget this daughter of Eve. City Players further gathered that Lola's legendary sleazy runs included her short spell with one handsome America-returnee broadcaster who paired with a music mogul to present musical programmes on many radio and television stations across the country. Lola also had another fling with United States-based celebrity fashion designer and actor who is married to an ex-beauty queen. But the latest of Lola's runs is her hot affair with a certain Lagos-based publisher of a celebrity magazine. Inside sources revealed to City Players that this publisher is madly in love with Lola and he's ever willing to meet both the heart and material needs of this femme fatale. It was gathered that the cool-looking publisher has been showering money and gifts on Lola, an action which many see as unnatural because the publisher is happily married and is not a spendthrift who spends money unnecessarily. The new change in the publisher's lifestyle, City Players gathered, aroused the suspicions of his business partner who tried to put a stop to the relationship between the publisher and Lola. The effort of the partner, we gathered, even led to a squabble between the business partners recently. Many have attributed Lola's tight reins on her 'lovers' to 'jazz'. It was rumoured that aside her looks, this twice married actress always charmss her prey. It is said that once you date her, it's only God that can set you free from her.